This is a lovely little side dish that goes well with any roast. It adds texture and colour, and is super tasty. 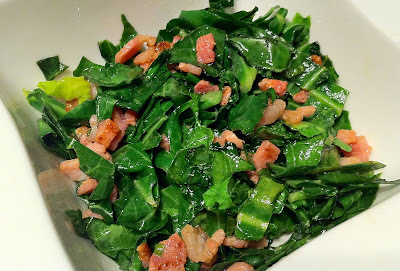 Top tip: Don't be tempted to fry in the same pan - the flavour of the bacon will completely overpower the spring greens. You can also use pancetta for a fuller flavour instead of bacon. 1. Slice the bacon rashers into small bits. Heat the oil in a pan, and add the bacon. Fry until crispy, and remove from the pan with a slotted spoon. Allow to rest on a sheet of kitchen paper. 2. Melt the butter in a separate pan until just bubbling. Throw in the greens and quickly stir-fry until slightly wilted but still crunchy. 3. Toss the bacon in the with greens, and serve warm.